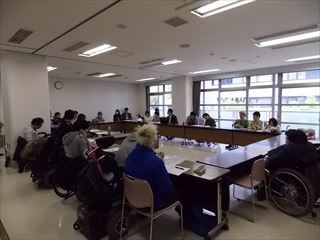 Recognizing the importance to foster leaders among young people with disabilities, we here at DPI-Japan last year began the Next generation of leaders with disabilities – Development and Empowerment Project (Empowerment School), with the support of The Kirin Foundation. We extended invitations mainly to member organizations, resulting in a large number of applicants from all over Japan and a total of twenty-one participants overall. The majority of these members had physical disabilities, but we also had those with incurable illnesses and intellectual disabilities join us (with three being from DPI secretariats). In the early stages, the members met, discussed, and learned about various topics over a series of four meetings. These ranged from institutional reforms and an all-round agenda for the disability movement, to individual issues such as education, employment, and accessibility, as well as needs and considerations for those with psychiatric disabilities and intellectual disabilities. Furthermore, we also invited South Korean with intellectual disabilities to join us, and listened to what they had to say about movement in their own country. On November the 2nd and 3rd, we took along a few project members and joined in the 19th People First Event in Osaka, having the chance to communicate with the organization’s members from all over Japan. Then, on December the 1st, DPI held its second Meeting on Policy Discussion. Here, we also conducted a special session, where we heard a report from students of DPI Empowerment School. In the panel discussion, the students each spoke about matters of interest to them – such as education, employment, and accessibility. They were also able to have engaging discussions with the meeting’s participants on youth development and future issues that needed attention in the disability movement. In the second half of the meeting, each person shared his or her feelings about the year past, and defined upcoming challenges. Moreover, the students learned what kinds of methods were most effective in resolving these problems, as well as forming action plans for both their individual agenda and for issues for the disability movement. As for the approach for the coming year, the members affirmed that they would maintain this student network, and took up the vision of a society where everyone could enjoy living together while accepting each other’s differences. Over the course of a year’s lectures and discussions, being able to hear the experiences of the movement’s predecessors was invaluable. We feel that not only did the participants strengthen their relationships with one another, but also reinforced their aspirations toward the disability movement as a whole. In future, we look forward to the seeing the participants become a proactive backbone of DPI’s activities. Picture 1: Previous chairman of the first Meeting on Policy Discussion, the late Mr. Mizawa. 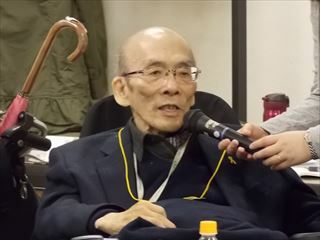 He spoke vigorously about his expectations for the next generation of youth with disabilities. Picture 2: New trainees from all over Japan, who are to inherit the spirit of the movement’s predecessors.